This dimmable LED Globe from Green Watt Lighting is energy efficient, consuming only 6 watts of power. It produces 500 lumens of light, making it an ideal replacement for a 60 watt incandescent bulb. 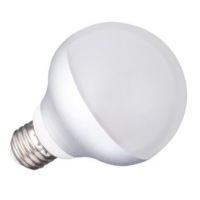 This LED globe has a color temperature of 2700K, emitting a warm white glow. With a lifetime rating of 35,000 hours, this bulb won't require frequent replacement.